A pirogue containing a beach seine sits on Beau Vallon beach, Mahe, Seychelles. Beach seines have been used for thousands of years by fishermen targeting coastal fish populations. The practice is still commonplace today, where in developing countries the fishery provides and important source of income and employment. Within the Seychelles beach seining forms a small part of the local fishery and is undertaken on only a handful of beaches on Mahe. 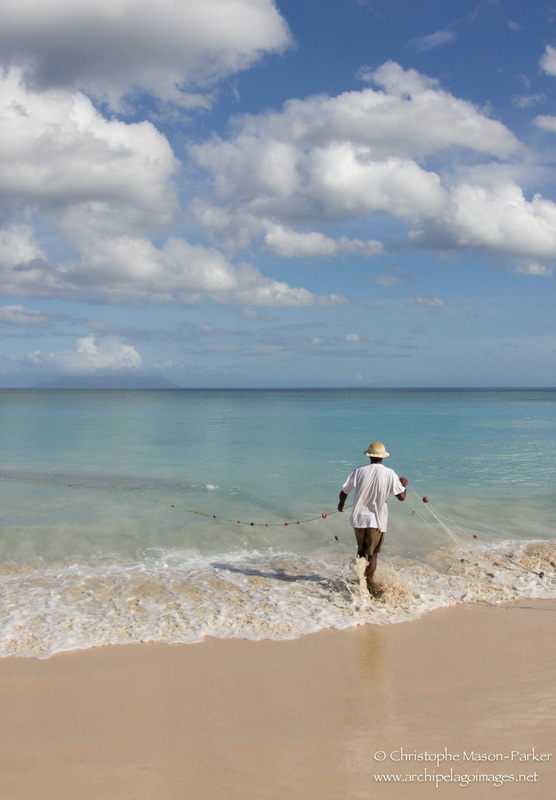 Beach seining requires the net to be dragged across the substrate and the technique is particularly effective in locations with sandy bottoms making it ideal for fishing off Beau Vallon beach. The typical beach seines used have weights attached to a leadline at the bottom of the net and floats attached at the top. The net used by fishermen in Beau Vallon lacks a codend but instead has a seine body of loose netting. Attached to each end of the net is a pulling rope which is hauled in from the shore dragging the net across the sandy substrate. The pirogue is a traditional flat bottomed boat and is used by the beach seine fishery in Beau Vallon to deploy the fishing net. The wooden vessel has no motorised engine and is instead manoeuvred with the use of a long pole and paddles. Fishing takes place close to the shore in shallow water and only during calm weather. The targeted species for the beach seine fishery are Indian Mackerel (Rastrelliger kanagurta) and Bigeye Scad (Selar crumenophthalmus). Between the months of September and April beach seine and gill net fisheries target the mackerel as large schools migrate close to shore. Successful fishing trips can bring in a substantial number of fish and at this time mackerel will typically sell for SR25 for a packet of five. Beach seines in Beau Vallon are usually deployed in the morning when the fish are more active and the sea tends to be at it's calmest. If a large catch of mackerel is brought in it will often be transported to Victoria market for sale. Any bycatch such as eagle rays, sharks or jacks are sold at the side of the road adjacent to the beach. In addition to the targeted species the beach seine fishery often catches elasmobrach species. Juvenile spotted eagle rays use the shallow waters close to shore as a nursery area and consequently are often caught in the fishermen's nets. Once caught the fishermen remove the barb from the base of the ray's tail and insert it into the top of the animals head (above right), causing a quick death. Once the fish have been encircled the net is pulled in from the beach. Up to five fishermen will help to pull each of the two ropes attached to the net. Though large enough to seat six men, the wooden pirogue is usually operated by a couple of fishermen who use a long wooden pole to push off the sandy bottom. Alongside juvenile shark species the beach seine catches stingrays and the occasional guitarshark (above) during the latter months of the year.